Love. Love. Love. 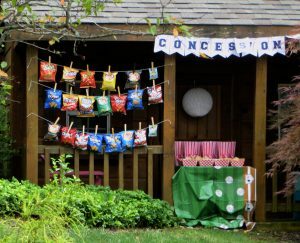 This playhouse turned concession stand. 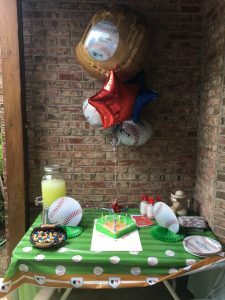 What could be more perfect at a sports themed party?? For the concession stand I stapled twine between the posts and we hung a variety of chips from the twine using clothes pins. Between the posts we placed a tablecloth covered table and had containers of popcorn and nachos and cheese available. Under the table we stashed a bin of chips and we quickly replenished the supply whenever it ran low. Perfect balloons, baseball centerpieces, plates, and tablecloth helped to decorate our cake table. But the main decoration was the glass container of “game balls” the birthday boy has earned over the years. Since the party was in the backyard and not visible from the street we attached an identical set of balloons to the mailbox and drew a huge chalk arrow with the caption, “Party This Way” on the driveway. 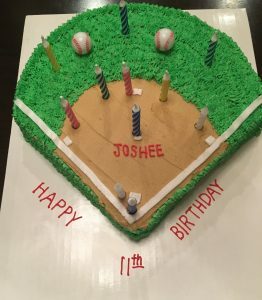 Please click here for complete directions on how to make this much-easier-than-it-looks baseball birthday cake. 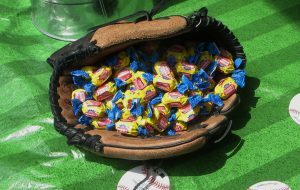 We sent the kids all home with a box of Cracker Jacks, and a pouch of Big League Chew. Crackers Jacks in the original box were more difficult to find that I had anticipated. I was able to find what I needed at Amazon.